Yesterday I featured a low cost, readily available everywhere item and today’s feature is just the opposite. Corolle dolls are definitely high end. They are sold around the world but they are designed and made in France. But it isn’t just in France, its more specific pedigree is self described on their website as only the French could do: “Corolle is located in the Loire Valley, the storybook region of France that is famous for its scenic beauty and magnificent chateaux.” You get the idea – you won’t find this in ToyRUs. The Corolle dolls are enchanting - as befits their Loire Valley origins, soft and lifelike with beautiful clothing and accessories. There are baby dolls, ballerinas, “les trendies" for older children and more. There are some interesting items for newborns including a blankie/snuggly, the mini baby doll rattle assortment that can be attached to a crib (one is a baby boy) and dolls with sewn-on features - safe for the youngest child. The Corolle line features lots of outfits and accessories to go with the dolls. And they also have a “French” touch. This set was featured at A Time to Play and it looked like everyone visiting the Corolle table fell in love with it. The BÉBÉ CHARMEUR GIFT SET comes with a heart-pattern carry bed, Bébé Charmeur, pink pajamas, pacifier, bib, baby bottle, and plate with spoon. 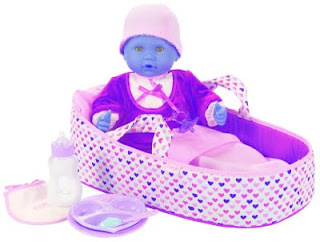 This is the kind of doll that can be your grandchild’s favorite for years. It is recommended for ages 2 and up. This is a pricey item at $90 but can really be a special gift that only a grandparent would splurge on. There also is a baby boy “Paul” doll. Since my only grandchild is a boy, this item caught my eye. Little boys like dolls too and boy dolls can be hard to find. Electronic free - There are no batteries or electronics – just an old fashioned doll! Cost – This is a pricey line but it is made in France - not China - and the quality and attractiveness of the product makes it worthy of consideration. How to get it – This can be a project. Their website provides a comprehensive list and they are in numerous specialty toy stores, but not at mass retailers like ToyRUs and WalMart. Website: The Corolle website provides pictures and information about all their products. It also has an easy to use menu so that you can find a store near you that carries the line. Check back tomorrow for another product review - I haven't decided which one yet so it will be a surprise.